THE SOURCE - Other Tapes - "1976 Reunion"
In addition to the four Beatles,George Martin was also allegedly present, Len Kovner,former co-owner of Davlen Studios, can independently confirm all of the above, as can the engineers who were then present. MOMENTS IN TIME WILL BE CONDUCTING AN AUCTION OF THE ABOVE. The audiotape itself, which is present in the case, was bulk erased allegedly at the BEATLE'S insistence, to try to keep secret the fact that this session ever took place. Supposedly, an unerased version exists in the vaults at Abbey Road. PRIVATE OFFERS WILL BE GIVEN DUE CONSIDERATION PRIOR TO AUCTION'S INCEPTION. 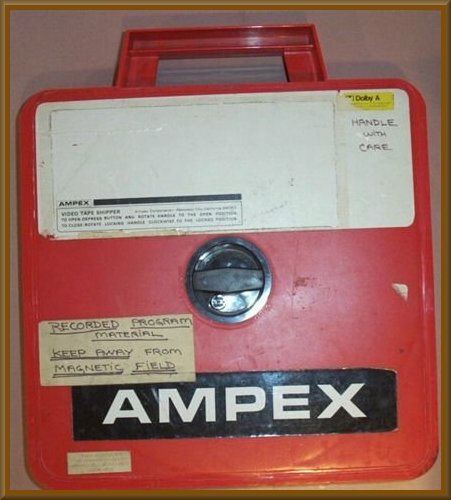 The Quarry Men used on their Grundig recorder. Uh...sorry, but they've been uh...recorded over. session may have been, in his opinion, inaccurate. names of the people involved as a matter of formality and respect." believe he was telling the truth to Mr. Deane regarding this historical event." LEN KOVNER, 29/5/97 pm 0500,Re: Davlen studio session??? Subject: Re: Davlen studio session??? >Third World, Rockin' Once Again. >No other details are available. >no information about sessions at Davel. >Can you assist in any way? some additional light and stories about these historical and failed events. Mystery surrounds an Internet auction site which claims to have proof that THE BEATLES reunited in 1976 for a recording session in LOS ANGELES. The website is auctioning a recordings list and tape of five songs that the Fab Four allegedly recorded on November 2 at Davlen Studios. It is also claimed that the session ended with the band storming out of the session. 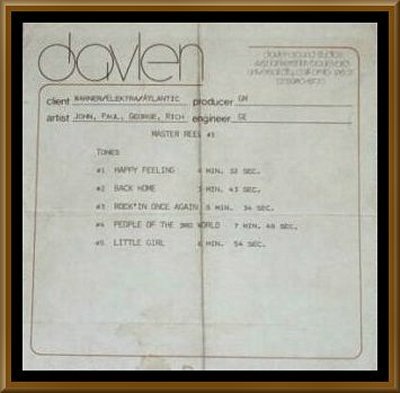 A statement on momentsintime.com said: "The names of the songs as listed on the Davlen Studios label are as follows: 1. 'Happy Feeling' 2. 'Back Home' 3. 'Rockin Once Again' 4. 'People Of The Third World' 5. 'Little Girl'. It adds: "In addition to the four Beatles, George Martin was also allegedly present, Len Kovner, former co-owner of Davlen Studios, can independently confirm all of the above, as can the engineers who were then present." However momentsintime.com say that the tape, which is present in the case, was bulk erased by request of The Beatles in order to keep the knowledge of the session secret. An unerased version of the tape is rumoured to exist in the vaults of the legendary studio, Abbey Road. However, a spokesman for Paul McCartney said: "What reunion was that? I am not aware of any Beatles reunion in the 70s."